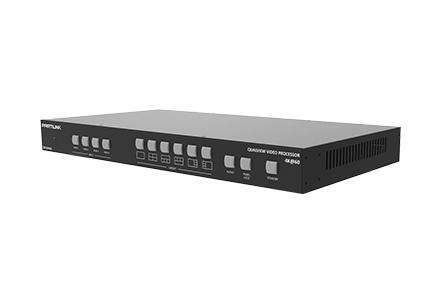 The Partilink VP-QV41H Quadview Video Processor is a simple, cost-effective video scaler designed to enable a 4K@60Hz, HD, SD computer display device, virtually handling any input resolution up to 4K@60Hz. 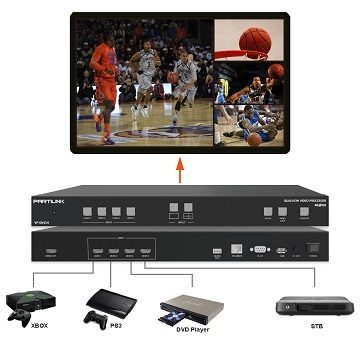 It provides 4 HDMI inputs, 1 analog audio output, and 1 HDMI output. Data Sheet incoming video signal and it intelligently converts and enhances that signal for the optimal appearance on your display. Manage IP-Based digital signage and video wall content remotely with Quadview Video Processor’s Web UI. Users can customize screen layout by preference. It supports maximum 8 sets screen layout saved on Web UI and 6 sets preset screen layout. The Quadview Video Processor handles standard and high-definition digital video sources with resolutions up to 4K@60Hz. 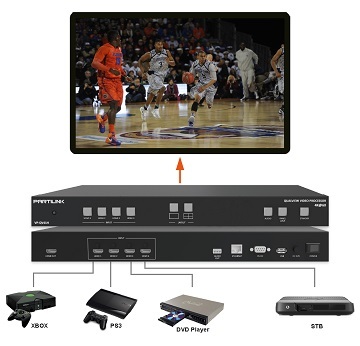 Regardless of the type of source device, this video processor is capable of scaling it up or down, reducing noise artifacts, and adjusting its aspect ratio to match the native resolution of your video display or computer monitor. 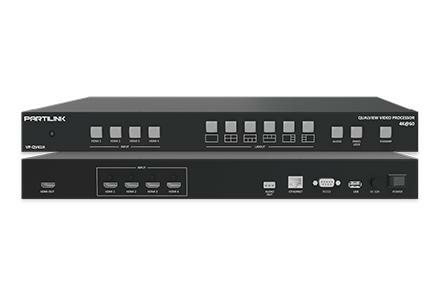 The Quadview Video Processor supports a wide selection of display resolutions up to 4096×2160, with auto-calibration that ensures a quick and easy setup and hands-off operation. 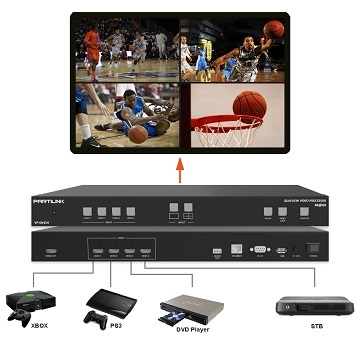 The Partilink VP-QV41H Quadview Video Processor is a simple, cost-effective video scaler designed to enable a 4K@60Hz, HD, SD computer display device, virtually handling any input resolution up to 4K@60Hz. 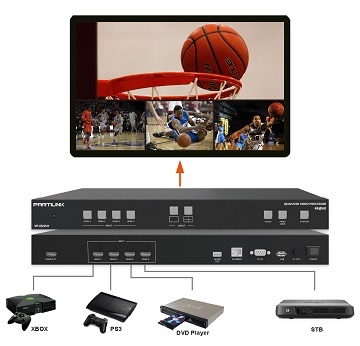 It provides 4 HDMI inputs, 1 analog audio output, and 1 HDMI output. 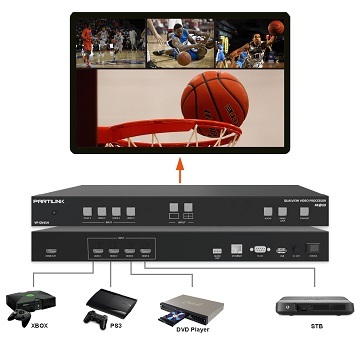 Fast switching technology integrated into the Partilink Quadview Video Processor improves the user experience considerably. 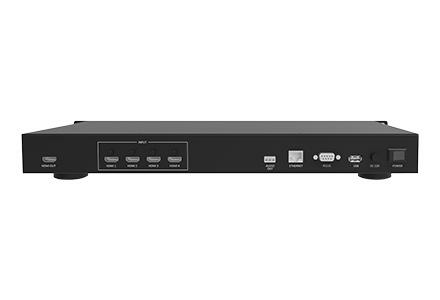 Users will notice a much faster response time in the HDMI receiver as they switch among the multiple HDMI inputs that are connected to the video source. Fully automatic operation by duplicating the EDID of display, simply connect the VP-QV41 with Data Sheet incoming video signal and it intelligently converts and enhances that signal for the optimal appearance on your display. 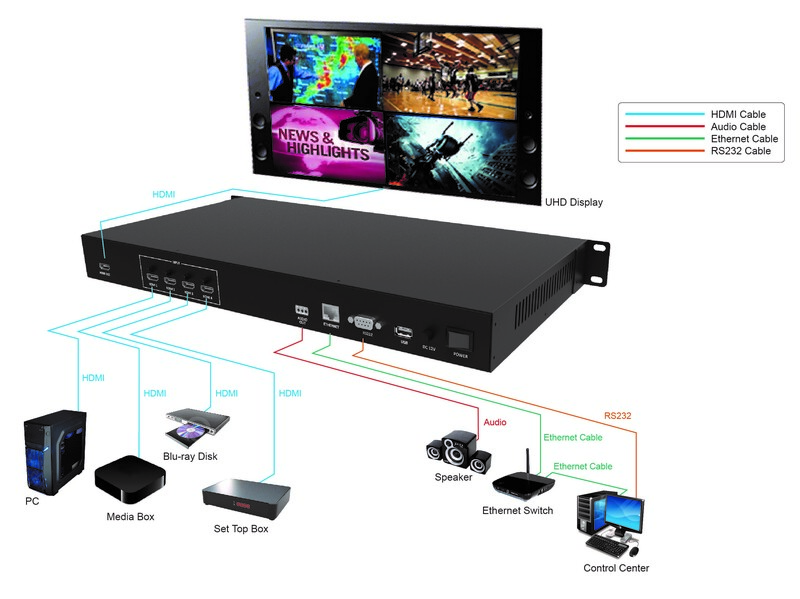 Manage IP-Based digital signage and video wall content remotely with Quadview Video Processor’s Web UI. Users can customize screen layout by preference. It supports maximum 8 sets screen layout saved on Web UI and 6 sets preset screen layout. The Quadview Video Processor handles standard and high-definition digital video sources with resolutions up to 4K@60Hz. 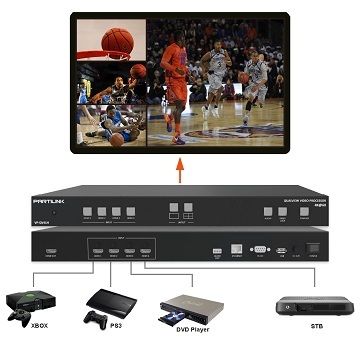 Regardless of the type of source device, this video processor is capable of scaling it up or down, reducing noise artifacts, and adjusting its aspect ratio to match the native resolution of your video display or computer monitor. 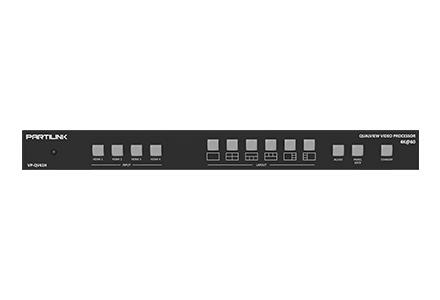 The Quadview Video Processor supports a wide selection of display resolutions up to 4096×2160, with auto-calibration that ensures a quick and easy setup and hands-off operation.